Larry Johnson recently provided me with a number of images for Conclave items and Siouan patches, and Ben Vincent sent me quite a few images of Siouan and Camp Waters emblems. As a result I've been spending time trying to find a good content management system ("CMS") to convert the Kecoughtan site to since it has grown way beyond anything I ever anticipated and well beyond simple maintenance of a few static HTML pages. 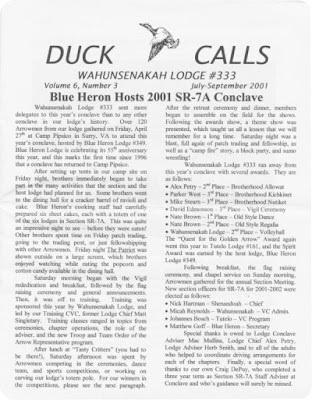 Meanwhile, today I posted a copy of the July-Sept 2001 copy of Duck Calls, the Lodge 333 newsletter. Thanks to Larry Johnson for scanning and sending the images. You'll find it along with many other copies of Duck Calls on the Duck Calls web page. 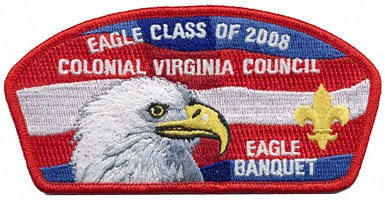 Colonial Virginia Council held their annual Eagle Scout Recognition Banquet on Saturday, March 21 at the Crowne Plaza Hampton Marina Hotel, and issued a commemorative CSP in honor of the Eagle Class of 2008. The design is the same as the CSP issued for the 2007 Eagle Class. Wahunsenakah Lodge Advisor George Homewood kindly shared these design images for upcoming flaps to be issued for the 2009 Section SR-7A Conclave. The Beaver Day flap shown above is restricted to Arrowmen who have performed at least 14 hours of service during the many Beaver Days the Lodge has scheduled to prepare Bayport Scout Reservation for the Conclave. 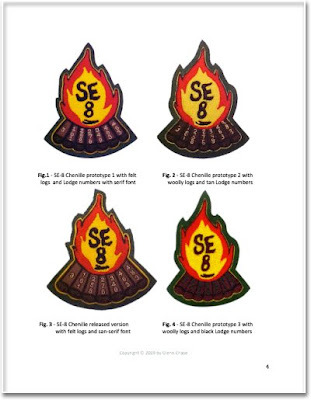 One of the final emblems issued by Section SE‐8 was an attractive chenille patch featuring the stylized campfire logo of the section. When it was designed and ordered the Section officers and Council of Chiefs knew it would be the first and last chenille patch issued by SE‐8, because their section would soon be history. This 4 page article with illustrations explores the history behind the SE‐8 chenille, attempts to explain its scarcity, and describes some rare prototypes.